If you have never had to wear a pair of prescription glasses or contacts before, then you probably have what is referred to as 20/20 vision. Many consider this perfect vision, but let’s investigate. This term is typically used to express the clarity or sharpness of vision measured at a distance of 20 feet. If you have been to an eye doctor lately, and you are able to clearly see what should be seen at 20 feet…then SHAZAM, you have 20/20 vision! Please join me in a happy dance, as I am part of this group as well. This doesn’t necessarily mean that you have perfect vision however, as this only specifies the sharpness or clarity of your vision at a certain distance. In fact, there are many other imperative vision skills that include eye coordination, depth perception, peripheral awareness, focusing abilities, and colour vision that all play a factor in your overall visual ability. Here’s a fun fact for you! Did you know that hawks, owls and other birds of prey have a more acute vision capacity than humans? Although a hawk has a much smaller eye than a human, it has tons of sensors packed into that space! This provides a hawk with vision that is up to eight times more acute than a humans, resulting in a possible 20/2 vision. I’d have to say I’m a little jealous! Just so we don’t get confused, here’s some more numbers for you. 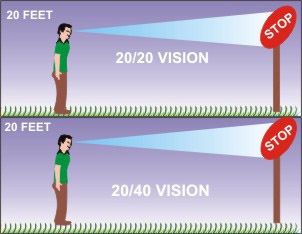 If you have 20/40 vision then this depicts that when you are standing 20 feet away from the chart, you are able to see what a “normal” human can see when standing 40 feet from the chart. Did you know that 20/200 is the cutoff for legal blindness in North America? This means that a legally blind individual would need to stand 20 feet from an object with corrective lenses to see it as clearly as a person with normal sight could from 200 feet. If you think of all the things you do in a day that rely on your vision, I’m sure you could draft a long list. Things such as reading the newspaper, measuring ingredients for your morning oatmeal, and driving to work all require what? You guessed it…vision! 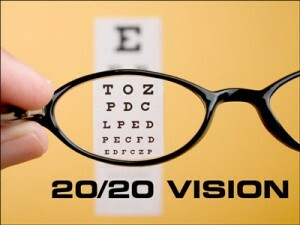 Although being classified as having 20/20 vision now is great, this may very well change at any time. I’m extremely grateful that I don’t require a prescription, despite my love and appreciation for styling glasses. Check out Swift Eyewear’s great collection, where you’ll find a style that fits both your face shape and awesome personality. You’ll love them!